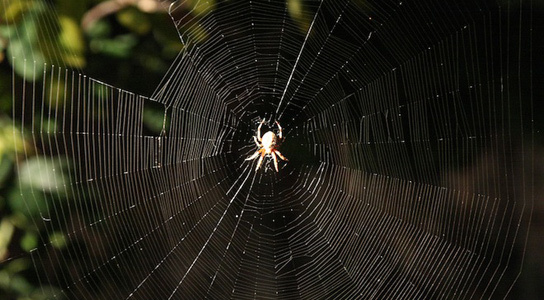 It’s a well-known fact that spider silk is stronger than steel and tougher than Kevlar, yet flexible enough to be made into a variety of different shapes. A new study has also shown that the material is also smart. Spider silk has a way of softening and then being stiff that is essential for it to function properly, states Markus J. Buehler of MIT, who co-authored the study which appeared in Nature (PDF) on February 2nd. Using computer models of spider silk and experiments on the webs of common European garden spiders (Araneus diadematus), the researchers found that a web’s way of reacting to different levels of stress are quite unique. Light wind will soften the web, allowing it to lengthen but retain its overall structure. A stronger wind at a specific location makes the silk go rigid enough for it to break. If only small portions of the web come apart, the overall structural integrity of the web is heightened. The researchers discovered that if up to a tenth of the threads are removed, the remaining structure is able to carry 3 to 10% more weight. Studying spider silk further could lead to applications in virtual networks, such as the Internet, to allow a local node to be sacrificed and keeping the whole system from breaking down. The protein structure could also give insight on how carbon nanotubes should be strung together to produce combat gear or space elevators. Be the first to comment on "Smart Spider Silk Might Lead to Carbon Nanotubes Strong Enough for Space Elevators"